Among my hunting gear, a few items truly stand out. I wish I had found Kenetrek extreme mountain boots years ago. I have a very bad ankle that I broke in a serious auto accident in 1971. I’ve been in pain for years, so recently I’ve begun to wear boots at all times. Boots with high-ankle support reduce my ankle pain. Hiking in the hills has been a problem for me and I’ve purchased many pair of hiking boots over the years and all of them helped solve my problems, but up until now, none of them worked well. I purchased a pair of Kenetrek extreme mountain boots last spring and I began wearing them during the July archery deer season. The more I wear them, the more I like them. Sometimes I even wear them to work. As long as I wear these boots, I suffer very little ankle pain. Not only do they have great ankle and foot support, they are extremely durable. The soles show very little wear, despite the 5 to ten miles of hiking I do religiously each week. The exterior of the boot is wearing “like iron.” I can’t say enough good stuff about this product. The tred on the sole practically sticks to the ground. I don’t know why, but I seldom slip when hiking with these boots and I climb hills on most of my hikes. When I received a reservation letter for Sacramento NWR, last week, I was elated. I was number 7 for Wednesday Dec 21. Number seven was the highest I’ve ever been drawn for Sac. I checked in with a couple of my friends who know more about Sac than I and they gave me the low-down. After great deliberation, (and advise from some of the regulars) I came to the conclusion that the blinds located on the eastern perimeter of the hunting area were most consistent producers. I made a list of the first seven blinds in order of desirability and I knew that Tom and I would be hunting in one of them. Tom and I ended up with blind 49, a top producer. Since we didn’t know which blind we would end up with, we came prepared for all scenarios, but primarily we figured we’d need as many decoys as we could carry. Normally, for hunting mallards in heavy vegitation like tules, a half-dozen mallard decoys is plenty. And, I often use only one, two or three decoys at a time. 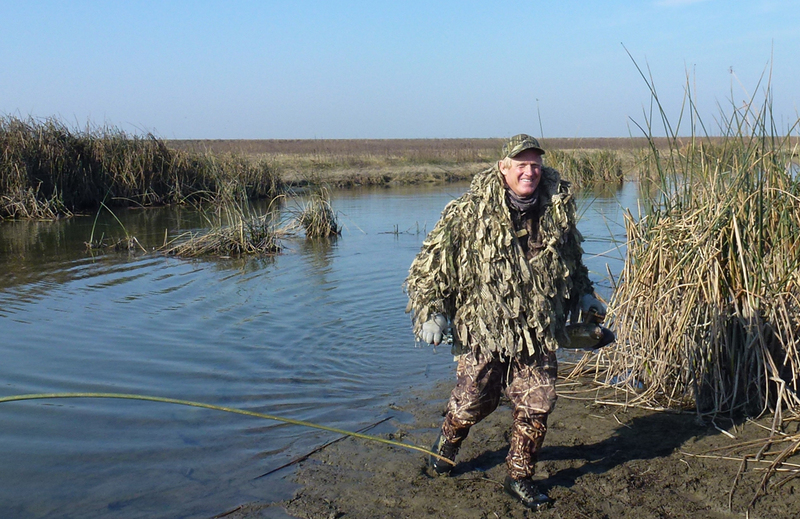 But, when hunting over open water with little cover, a large decoy spread is valuable and most of the Sacramento perimeter blinds are on ponds with little or no cover. I stopped at Broadway Bait in Sacramento and purchased four floating spec decoys. I figured they would have value. 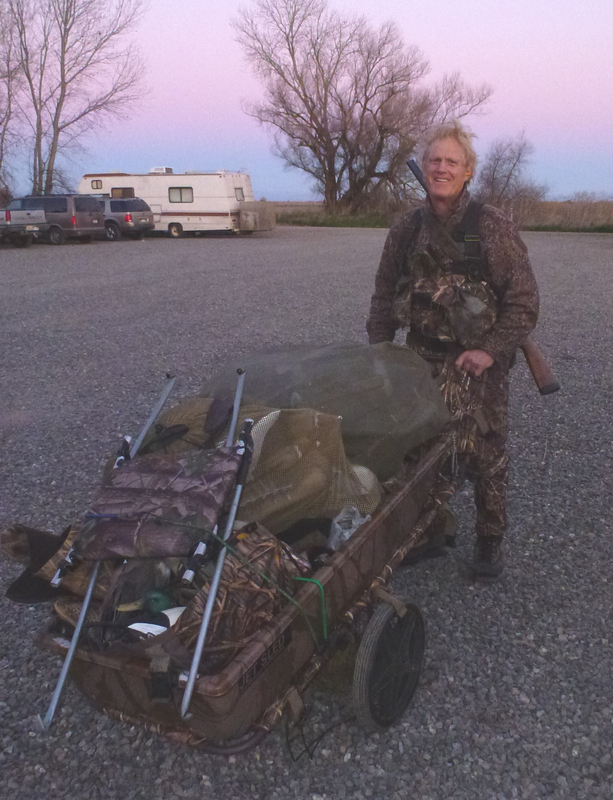 Our total spread was about 26 decoys, six of them specs, a dozen floating pintails, several floating mallards and six stand-up decoys that we placed on dry ground around the island blind. Because I suspected that the island blind would have no place for Lola to hide, I brought along the dog stand I use to keep her out of the water. Fortunately there was a small tule patch near the blind large enough to hide her. That’s where she spent her day, watching us hunt from about 20 yards away. Because the island was void of any cover, I went back to shore and collected brush. Aster works well and I found enough of it along the edge of the pond to hide us pretty well. The hike to the blind was easy on a gravel path. The pond was easy wading, but tailed off to deeper water on the east side. To the east of us was a marsh closed to hunting and it held many birds. As the sun rose, we were surprised that more ducks and geese were not in sight. That changed quickly when the shooting began. The sun rose and the birds flew high. The fog that we had expected did not materialize and by noon we had a three spoonies and two gadwall. Shortly after that, we crunched our first green head of the day. The air remained still until about 1:00 PM. That’s when things changed dramatically. The north wind hit us with a gust and the birds began to fly. 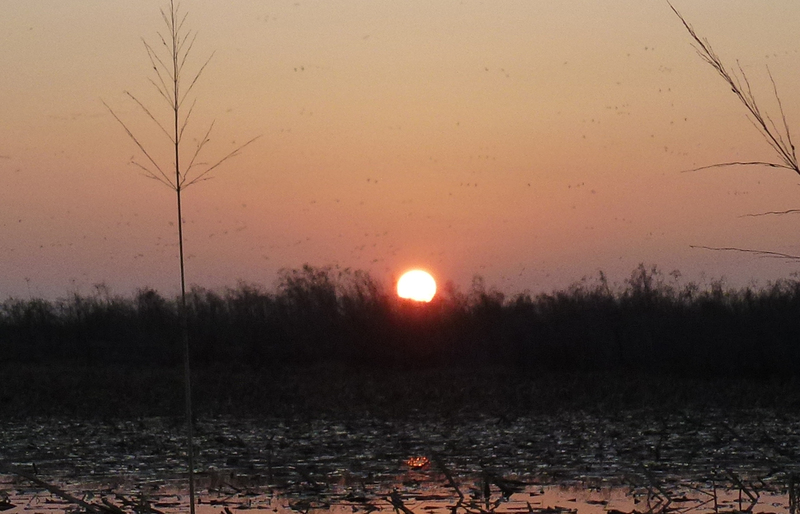 Our adrenaline flowed as flock after flock of ducks passed over and around our blind. No more spoonies or gadwall. We were after mallards and spring and that’s what we got – until we finally ran out of shells around 4PM. For the last hour we loaded only one shell at a time. We didn’t reach limits, taking home eleven ducks. Four mallards and one drake pintail were the best of the lot. We missed some specs and snows. Tom also knocked down two birds (one mallard and one pintail) that flew off after hitting the deck. It was a fantastic hunt. We could have gone back for more shells, but concluded that 50 shots was enough for one day. Our cart was well loaded. 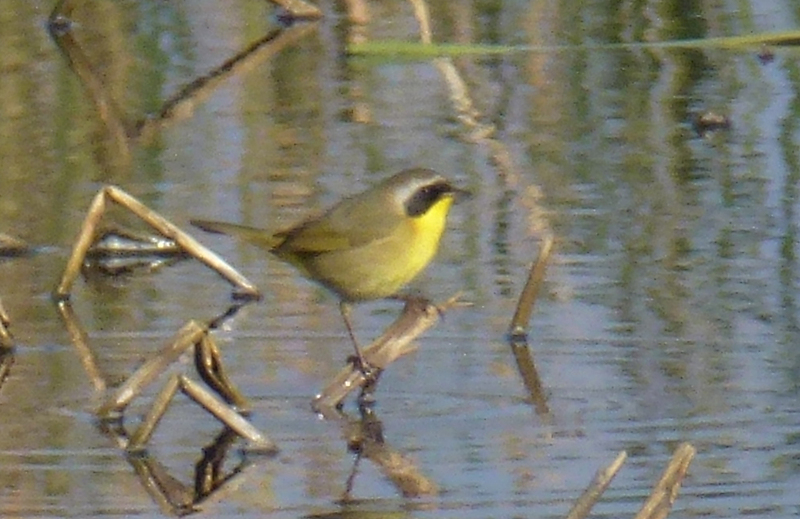 As I hunted ducks last weekend, a common warbler with a mask whipped around the pond nearby. 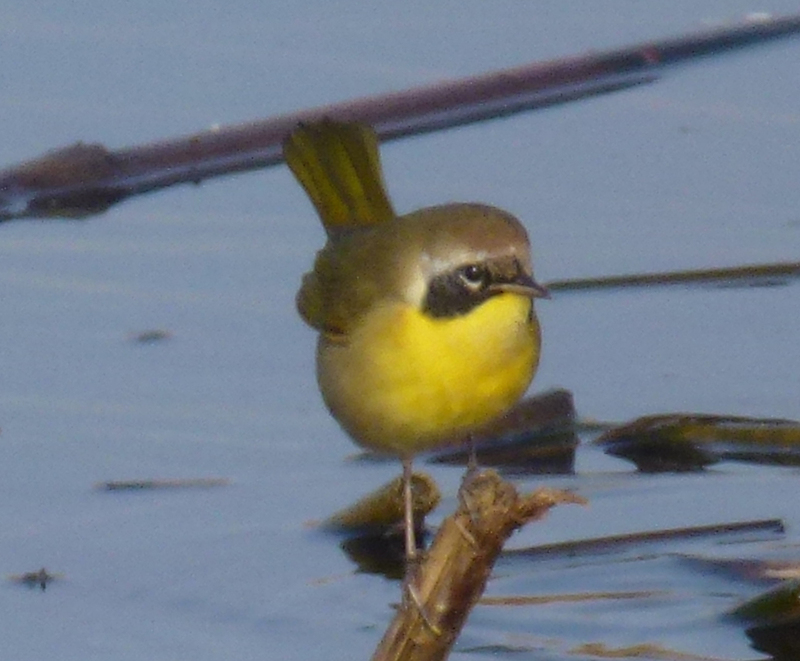 I have observed this warbler on many occasions, but have never successfully photographed one. The warbler seldom stays still long enough for a good photo and these birds seem to never be available when I’m prepared to get a good photo. Here are a couple shots from last Saturday. 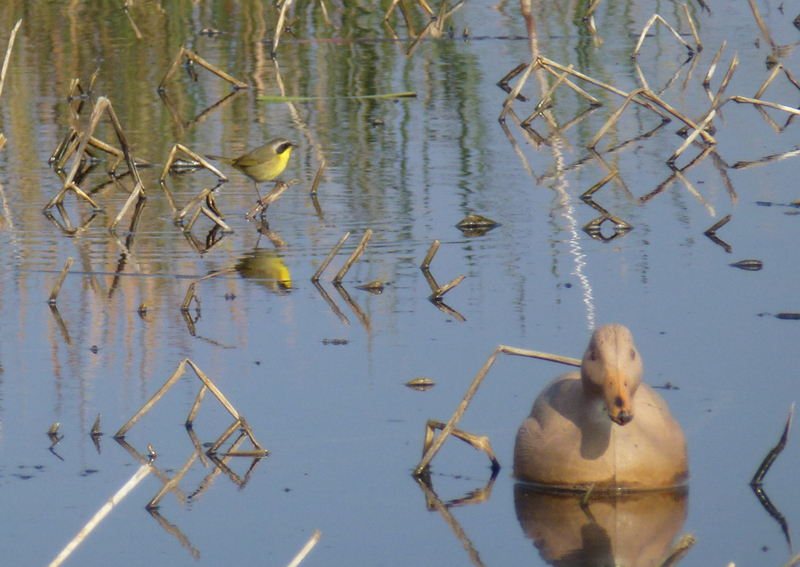 The warber was hunting along the waterline near my decoy. This photo is not perfectly clear, but the angle is nice. This is the best photo, but the angle is not so great. I’ll keep trying, but these birds are tough subjects. 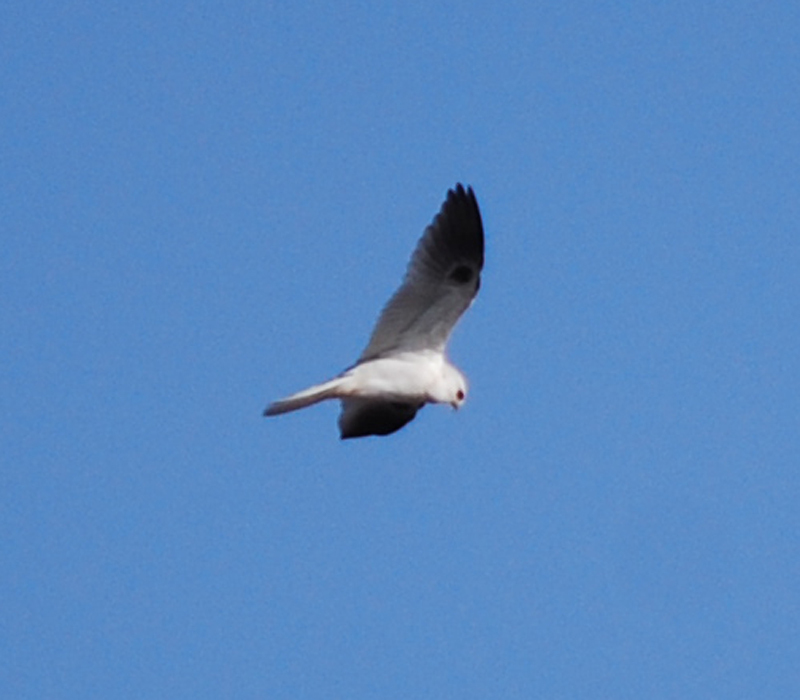 While sitting in my barrel blind on Saturday, a black-shouldered kite caught my eye. It was flying fast and low. Right behind the kite was a harrier (marsh hawk) in hot pursuit. As I wondered what was going on, the kite turned skyward, flying vertical. As it did so, it released prey from its grasp and the potential meal dropped towards the water. Here's a harrier photographed at our ranch. 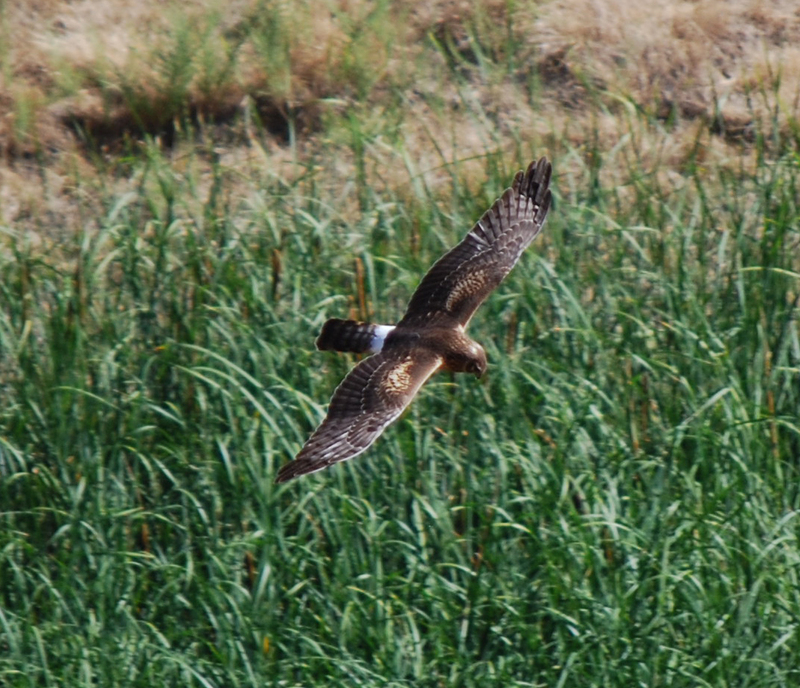 The trailing harrier swooped down and snatched the apparent rodent from the air before it hit the water below. It was a nice grab. The waterfowl season has been up and down so far. Three trips to the grasslands produced two busts and one boom. 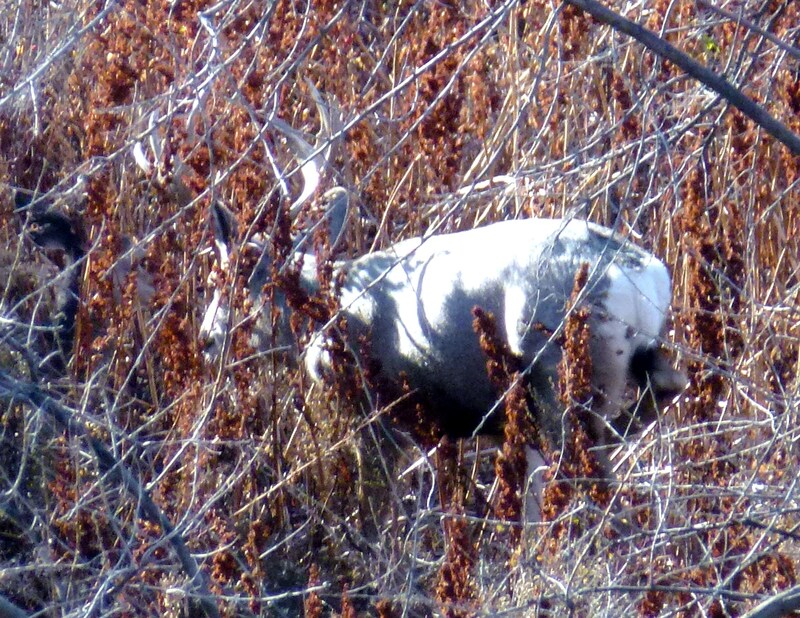 Hunted Salt Slough on Wednesday the 30th of November when the winds nearly blew us off the area. We didn’t do well in the howling winds. By the time we found a pond with ducks, the wind was blowing so hard that the ducks didn’t fly – at least not where we were. We held out until about 3:00 PM and headed home with one ring-neck duck between us. On the following Saturday, I hunted the grasslands on a private club. My host and I shot 14 ducks of the mixed bag variety. Strong winds helped us on that day. I had a poor shooting day, which is common in strong winds. On Wednesday the 7th of December, my friend Tom and I took advantage of reservation #4 at Merced. We decided to go with area E in the bypass. This is a mallard resting spot drainage that’s about 30 yards wide. First time at this spot for us, but we wanted to give it a try. Mallards worked frequently, but they were very shy. We never fired a shot despite having birds in sight most of the morning. 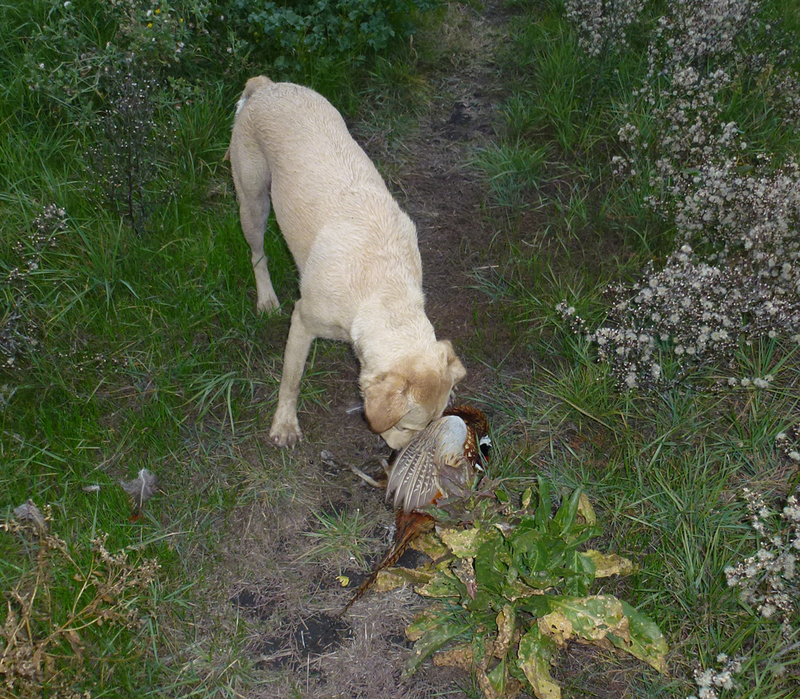 Our afternoon pheasant hunt at Salt Slough was also a bust. However, we accomplished some serious scouting and we’ll be back. The slough was about 30 yards wide and the mud made for difficult wading. Wear stocking foot waders and tight boots for this area. This last weekend we hunted Webb Tract in the Delta and shot three geese out of about 50,000 we saw. The conditions just weren’t right, but the birds were there. We saw plenty of geese last weekend, but didn’t kill many. Click on the photo to see the geese in the sky. 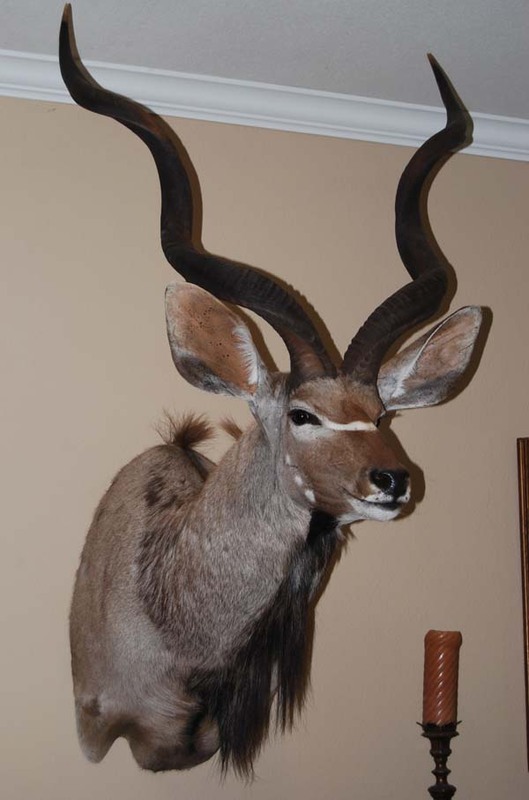 Here’s a classic African trophy mount from my trip to South Africa in July 2007. It hangs in my family room. I replied yes, but besides killing the animal, I also like the preparation for the hunt, looking for suitable game, excitement of the stalk, anticipation of the shot, tracking, dressing out, sharing with others, creating food products, eating the meat, observing my animal mounts, etc. The reason I made the statement about plain vs. trophy hunting was to point out that many people hunt to reach trophy standards created by others. When you hunt by this standard, you pass up opportunities to bag animals because others don’t consider them a trophy – even if you do. I was pleased with my 2011 muzzleloader buck, a small trophy. After reflecting a little longer, I replied that the most exciting part of the hunt for me is right after I make the decision to kill something. That’s when my predator adrenaline kicks in – when I realize that the critter I’m looking at is possibly going home with me as my trophy. 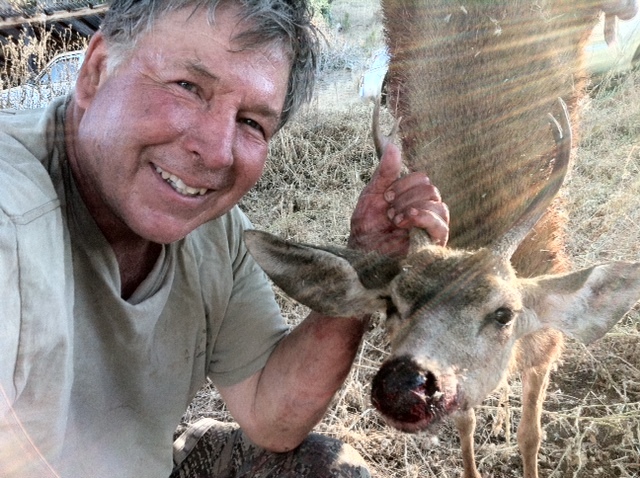 Although I wanted to bring home some venison from my 2011 Nevada mule deer hunt, I wasn’t inclined to kill one of these small bucks which, stood around about 100 yards from me and my ATV. There’s a difference between looking at a deer and looking at a deer you intend to shoot. Every deer is an easy target until you decide you want to take it home. Once killing a specific animal becomes your objective, the hunt takes on a new perspective. There’s a big difference between photographing a deer and shooting at it. I never get nervous while photographing a deer, but shooting a deer is a completely different experience. And, I get excited every time I shoot an animal. That’s because I only shoot animals that excite me. I guess you could also call them “plain”trophies. Here is Lola with one of my most recent trophies. The breast meat is in my fridge and the tail feathers decorate my family room. This palmated buck hid in a creek bottom, but a doe distracted him for a photo. The sun made photographing difficult, but the palmation is clear. 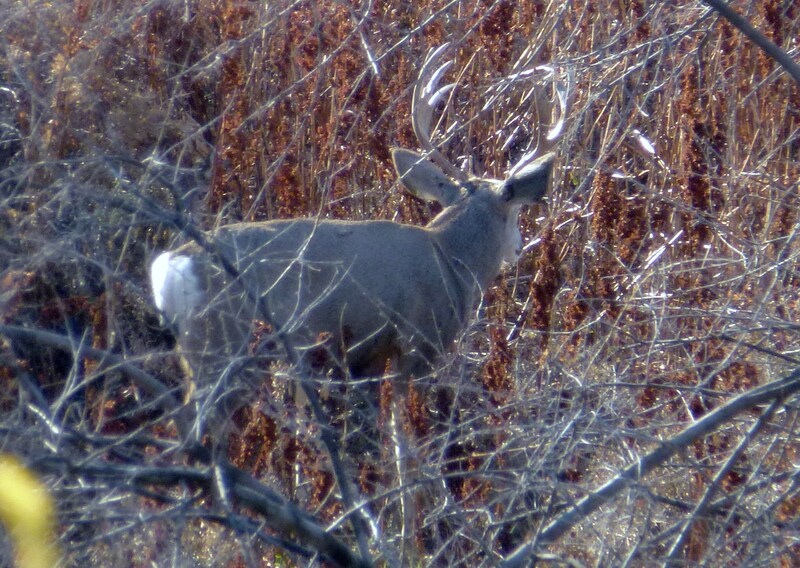 In my recent travels, I spotted this palmated buck following a doe in a creek bottom. 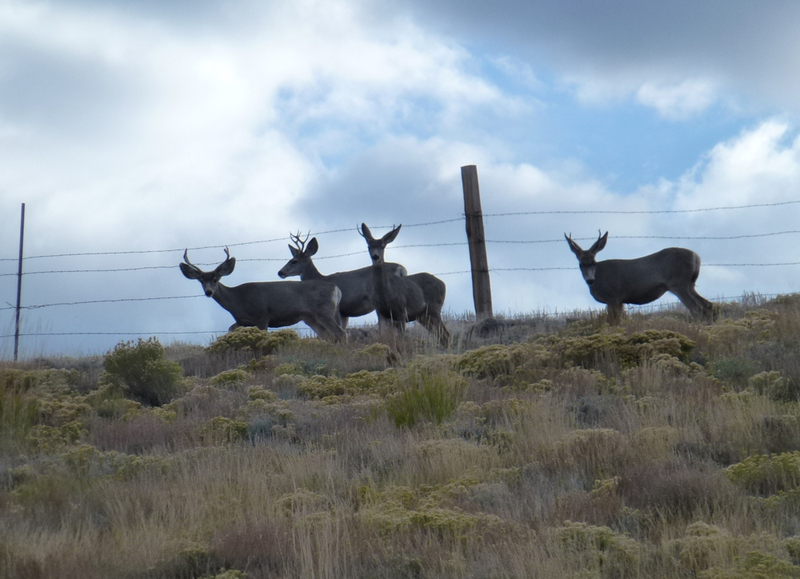 Although it was mid day, a couple of my photos showed the palmation, a very rare occurence in mule deer – first one I’ve ever spotted. Here he is from the opposite side. I tried, but failed in attempts to get a better photo of him.